New and available here at EnviroCams a PTZ-4K-22, an indoor/outdoor IP PTZ in 4K RESOLUTION. This IP PTZ Camera delivers 4K resolution (4000 x 3000 – 12Megapixel) at 20fps, and can also be set lower if needed, with a motorized zoom lens (6.5mm to 143mm), is very smooth, and gives you the ability to see things in unprecedented detail (4K detail, no less) at a distance. The huge infrared LED lamps onboard this awesome 4K PTZ, are intensity-controlled Smart IR lamps. They can throw out light as far as 800 feet. This PTZ can have as many as 1024 Preset positions, can run Patrols and Patterns (It can run up to 16 patterns as well as patrols, and can remember patterns that are as long as 15 minutes per pattern). It can perform these Patrols and Patterns at high speed as well – up to 300 degrees per second rotation is possible. The PTZ-4K-22 can tilt past straight down, and will automatically rotate the picture right side up when it passes that point. It also has a Home position that it will return to after a time you have set. This camera has Audio input wires and Audio output wires as well. This makes it possible to not only add an external Mic if needed but to also add a speaker and have 2-way communication at the camera end. This PTZ also supports many Smart Analytics – People counting, Face Detection, Line Crossing, Intrusion, Motion, & etc. The PTZ-4K-22 comes standard with two mounts already included: The Wall Mount arm, and the Flush Mount Pendant as well. Other mounts can also be ordered. For more information about our IP PTZ 4K camera, call one of the Sales Engineers toll-free 866-264-0041 here at EnviroCams or stop by our website. 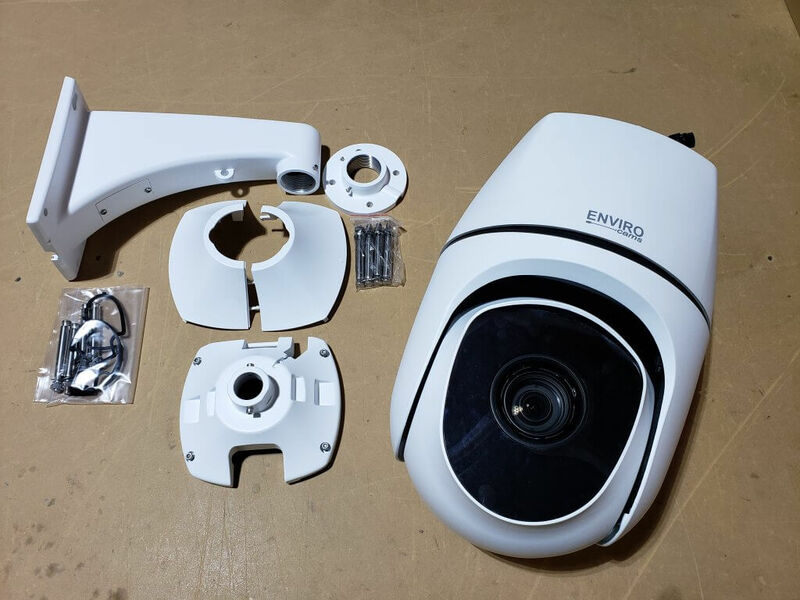 This entry was posted in Blog, IP Camera System and tagged 4k camera, Indoor/Outdoor PTZ 4K.